Because you most certainly can have it all. A dress that’s cute and comfortable? Yup. We added ruching and pleating in just the right places for a best-of-both-worlds situation. So you can look as good as you feel. Made in NYC. Fit and flare silhouette with partial belt at high waist. 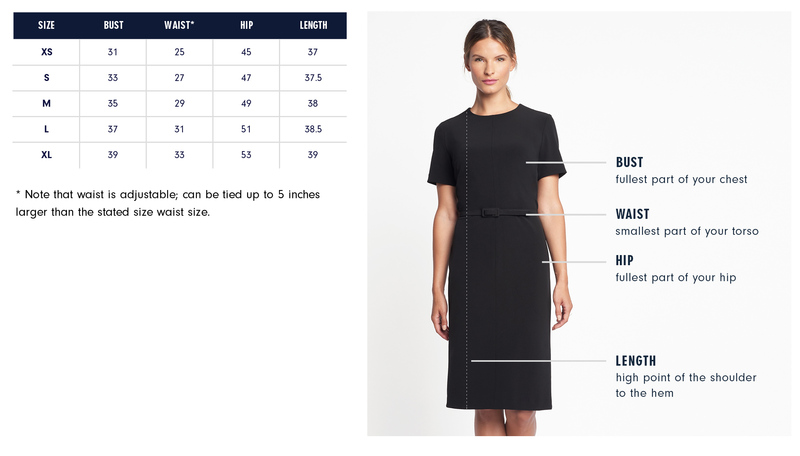 Our model is 5’10” and wearing a size S.
Exact measurements of the Morton Dress in the chart below. All measurements are in inches. Please see our Brand Fit & Size Guide for general brand fit, sizing, and measurements. Care: Machine wash mild; lay flat to dry. Do not iron. Fit and flare silhouette with partial belt at high waist. There is a lot of subtle detail in these dress. I really love the ruched waist with the adjustable tie in the back. It defines your waist without restricting.